The Portuguese policeman, who was in charge of the investigation into the disappearance of Maddie, remains convinced of the responsibility of her parents. He has published a book against the McCann couple. 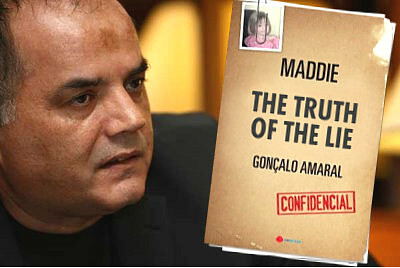 Gonçalo AMARAL led the investigation into the disappearance of Maddie, in Portugal, for several months before being dismissed for having publicly criticising the attitude of the English police. Since then, he has retired early. In a book out today in France *, he delivers his truth. According to him, the investigation is definite: Maddie died accidentally in the apartment where the family spent their holidays. The parents would then have staged an abduction. Without formal proof, his book, very much against the parents, raises real questions. What evidence do you have to support your version? Gonçalo Amaral. There are several. We have found contradictions in the statements of the McCanns and their friends. An Irish couple say that they saw Gerald McCann, on the evening of the events, with a child in his arms. In terms of findings, we discovered the fingerprint of Kate McCann on the window of Madeleine's room. The shape of the imprint indicates that she has opened this window. But she says that the window was open when she entered the room. It is therefore clear that she wanted to steer the investigation toward the thesis of the abduction. Finally, there is scientific evidence. The dogs detected a scent of corpse in the living room and discovered a trace of blood in the same place. Traces which were also discovered in the rental car. True, but the results still indicate that the samples resemble the DNA profile of Maddie. These indices are in addition to one other. 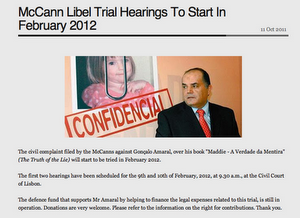 Why would the McCann couple lie? Because they had been negligent with their children. They dined and left them alone. Such behavior was reprehensible. So they staged the story of the abduction. That's true. At the time, there was no specific procedure in case of a missing child. The site has not been well preserved. Since then, these shortcomings have been repaired. What is your main regret about this investigation? I think it would have been to very quickly organize a reconstruction. We could then have realised the contradictions in the statements of Kate McCann and other witnesses. Unfortunately, my leader considered that it was impossible to implement. Then, the parents refused. How was the collaboration with the English police? With the investigators on the ground, it went very well. However, it was much more complicated with the headquarters in Great Britain. The information we had asked for created a lot of trouble to be taken up. The McCanns have managed to influence the opinion of the British police and to win their case. In Britain, the vision of the record is political. On the ground, it remained the police. Will Maddie be found one day? Today, the file is archived. The parents did not want it to be reopened. They did not want the truth. Yet I am convinced that there are still avenues to exploit. Unfortunately, it is a dead body which we need to search for.